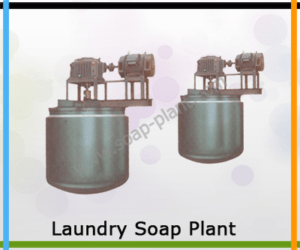 Laundry soap plant is an ideal synchronization of inline machineries. It shows good automation practices with soap making processes. Procedure of production is divided in several simple steps. It comprises machineries regarded these steps. Different manufacturers use different kinds of formulas for the production of laundry soaps. Our laundry soap plants are available with different capacity according to varied batch planning. Raw material for the laundry soap is mixed in mixer machine. Simplex plodder and Triple roller machine works for the refine and extrude function of the material. Material is subject to extrude with vacuum. Rotary bar cutter cuts and makes bars of definite length. Foot operated stamping machine precisely cut the bars in specific shape. Our laundry soap plant is good integration of various processes like mixing, refining, extrusion, cutting and stamping. With best quality construction material, we offer optimum quality laundry soap plants. Our plants are demanded in domestic as well as international market. Our plants are successfully running in several countries of Asia, Africa, Europe, North America, South America and Australia. Our long-term customer relationship has helped us to serve our customer base.